The aim of our studies was to determine the relation between temperature and the respiration rate of the forest soil organic layer along an altitudinal gradient while controlling the effects of the soil characteristics. The respiration rate was measured in laboratory conditions at different temperatures, 0, 10, 20, and 30°C, in samples collected in the Polish part of the Western Carpathians at 600, 800, 1,000, and 1,200 m above sea level from four different mountains, which were later treated as replicates. The increase in the average respiration rate between two consecutive temperatures was expressed as Q 10 coefficients. Among the nutrients measured in the soil organic layer, only the total organic N concentration significantly increased with elevation. The temperature effect was significant for both the respiration rate and the Q 10 values. The calculated Q 10 values were highest for the temperature range between 10 and 20°C, and the lowest values were obtained from the highest temperature range (20–30°C). 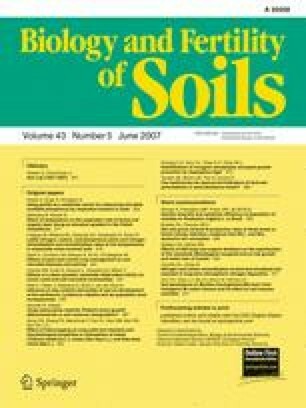 The altitude effect was significant for the respiration rate but not for the Q 10 values, indicating that the temperature sensitivity of the soil respiration did not change much along the studied altitudinal gradient. We thank Ryszard Laskowski for helpful discussions and suggestions about the statistics. This work was supported by the Polish Committee of Scientific Research and the Jagiellonian University (grant BW 13/2002).